The OMB-LOGBOOK-300 is no longer available please see the OM-LGR-5320 as a possible alternative or contact our data aquisition department. The OMB-LOGBOOK-300 is a portable data acquisition system that can be used for remote, portable and unattended operation. It is also operational with a PC attached. The OMB-LOGBOOK-300 combines on-board intelligence and a large capacity PC-Card removable memory with the industry’s easiest and most powerful data logging software. Its 16-bit, 100-kHz A/D and triggering capabilities make it ideal for collecting high and low speed phenomena. A comprehensive array of signal conditioning expansion cards and modules are offered that allow the OMB-LOGBOOK-300 to take measurements from virtually any transducer, from thermocouples to accelerometers. The OMB-LOGBOOK-300 data acquisition system includes LogView graphical display and acquisition software, which allows for fast setup and easy use, with no programming required. LogView software uses a spreadsheet metaphor rather than programming to configure the channels and the acquisition parameters. Once an acquisition configuration has been developed, it can be downloaded to a PC-Card for transport to a remote OMB-LOGBOOK-300, or it can be directly downloaded to an attached OMB-LOGBOOK-300 via the serial or parallel port. 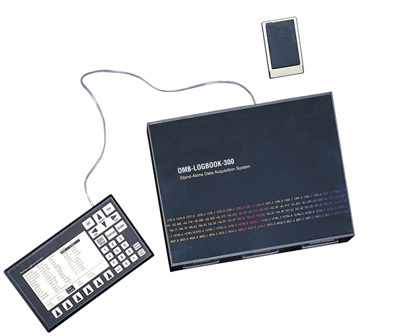 The OMB-LOGBOOK-300 can be used in stand-alone mode where no PC is present, or it can be linked to a PC via a serial or parallel port for interactive data collection. A PC running LogView can interact with an attached OMB-LOGBOOK-300 at any time, both during the setup and/or while the acquisition is taking place. To observe acquired data, channel values can be displayed in any or all of LogView’s many realtime indicators. Along with simple triggering and continuous data logging, the OMB-LOGBOOK-300 can be configured to intelligently collect only the data you want. For sophisticated triggering, a calculated channel can be specified as the trigger or the stop event. A calculated channel can describe virtually any combination of channel conditions. For example, you can develop a calculated channel called TRIG and specify it as the trigger channel. If the channel’s equation is TRIG = (Temp1 - Temp2) > 50.0, the data collection process will be triggered when the difference between the two temperature channels is above 50.0 degrees. The OMB-LOGBOOK-300 offers a scan sequencer that allows you to select each channel and associated input amplifier gain at random. The sequencer circuitry circumvents a major limitation encountered with many plug-in data acquisition boards–a drastic reduction in the scan rate for external expansion channels. All inputs, including analog, digital, counter, and calculated channels, are sampled at 100 KHz allowing time correlation of mixed signals. The OMB-LOGBOOK-300 permits each scan group to be repeated immediately or at programmable intervals for up to 10 hours. Within each scan group, consecutive channels are measured at a fixed 10 µs/channel rate. If data collection is only desired under specific conditions, an appropriate trigger can be specified. When using a trigger to start the acquisition, a pre-trigger count can be supplied so that information just before the trigger can be collected and saved. The stop event definition specifies when the data collection activity should end. A wide variety of trigger sources and stop event choices provides a high degree of exception capture flexibility. For example, the OMB-LOGBOOK-300 can be configured to capture all data from all input channels for as long as the temperature difference between channels 1 & 2 is greater than 50 degrees. The system can be expanded using a comprehensive line of signal conditioning and expansion options. The OMB-LOGBOOK-300 is expandable to up to 256 analog inputs and 208 digital I/O lines. Economical signal conditioning hardware includes thermocouple, RTD, high gain, high voltage, current, strain gage, accelerometer, frequency, filter, and simultaneous sample and hold. All of the channels in an OMB-LOGBOOK-300 system, including the base I/O and expansion channels, are sampled synchronously, providing time correlation of all collected data. The OMB-LOGBOOK-300 provides both internal and external pacer clock control so that scans can be collected using the OMB-LOGBOOK-300’s internal programmable oscillator or an externally supplied custom frequency clock. Unlike many multiplexed input data loggers, the OMB-LOGBOOK- 300’s base analog input channels have a unique buffer-amplifier-perchannel design to eliminate noise and channel-to-channel crosstalk while maximizing accuracy - even with high-impedance transducers. For ease of use, all of the OMB-LOGBOOK-300’s settings are software controlled, eliminating the need for switches and jumpers. Each channel is digitally calibrated, eliminating drift-prone potentiometers. Unlike many plug-in board data acquisition systems, the OMB-LogBook-300’s programmable channel/gain sequencer scans expansion channels at the same rate as its on-board channels. For this reason, the OMB-LOGBOOK-300 is well suited for test applications that require both high channelcount and high speed. LogView uses a series of spreadsheets to allow simple setup and display of all channel parameters. No auxiliary dialog boxes, configurable block diagrams, or programming methodologies are employed. Simply select the appropriate cell, choose the desired setting from the dropdown list, and the parameter is set. To apply the same setting to multiple channels, select a block of cells within a column and use the spreadsheet’s fill-down feature. After the channels and the acquisition parameters have been configured, download the configuration to a PC-Card in one of your PC’s sockets, or send the configuration directly to the OMB-LOGBOOK-300 via the serial or parallel port. When a PC-Card is used to transport the acquisition configuration to a remote OMB-LOGBOOK-300, inserting the card into one of its sockets signals the OMB-LOGBOOK-300 to read and execute the new acquisition configuration. Once the channel configuration parameters have been downloaded to the OMB-LOGBOOK-300, LogView can display the channel values of a connected OMB-LOGBOOK-300 in real time, both before and during an acquisition. LogView conveniently displays channel values in the channel configuration spreadsheet or in real-time bargraphs, analog meters, and digital indicators. All inputs including analog, digital, frequency and calculated channels are collected synchronously so that data from widely dissimilar inputs can be correlated in time. Within the analog spreadsheet, an offset adjustment or 2-point calibration can be performed for each channel. This function compensates for inaccuracies in signal conditioning circuitry and sensors. See the "Related Links" Section at the bottom of this page for a list of compatible expansion cards. 참고: The OMB-LOGBOOK-300 includes LogView software and a complete user’s manual. Parallel port cable sold separately.